It’s an end-of-the-world movie, like a disaster movie, but unlike any that has come before it. It’s not about the impending disaster but rather how two unique individuals handle it within themselves. The characters that Lars von Trier has created are fascinating creatures. Perhaps a little more extreme than most people you would meet but they are whole in their response to life. Justine can’t seem to find a way to be happy even though it’s her wedding day. Claire is extremely anxious about a planet that is in a crash course with the Earth. They are sisters and the dichotomy between them is enormous but provides such an interesting platform for us to view the end of the world from. 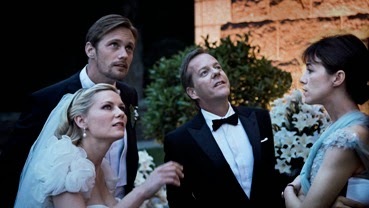 in MELANCHOLIA, a Magnolia Pictures release. Photo courtesy of Magnolia Pictures. Photo © Christian Geisnaes. The third character was Claire’s husband, Justine’s brother-in-law, John (Keifer Sutherland). He’s supposed to be the sane one. He’s rich and successful and just has to find a way to manage the insane women in his life. I thought I had a handle on him, but turns out that I didn’t, just as he may not really have a handle on things himself. Kirsten Dunst in MELANCHOLIA, a Magnolia Pictures release. Photo courtesy of Magnolia Pictures. Photo © Christian Geisnaes. I would say that the film is much more about the characters than the story. But, it’s also about the visual presentation. The colours, like the poster with a lost Kirsten Dunst standing in her wedding dress in a background of green, are brilliant and striking. The opening shots of the film are of the sisters on the final day. They are very bizarre representations of the sisters and their actions, but in the end, they leave us with visual cues of what they were feeling. 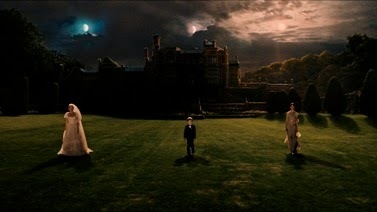 The film is about melancholia, in all of its forms, and with some simple but effective metaphors. I never felt too sad for the sisters, but perhaps I connected more with John and I just wanted to find a way to help them. That feeling, whether it’s a form of melancholia or not, will stay with you.